Before we had film, horror mostly thrived thanks to short stories; sure, long-form works emerged here and there, but, as is the case with most literature, it arrived from an oral tradition. It’s interesting to note that horrific campfire tales still endure more so than other storytelling genres, so it probably should come as no surprise that the popularity of the short-form has helped to land scary stories on the big screen early and often in anthology films. 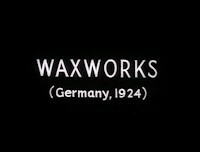 Waxworks is one of the earliest examples of the format; hailing from German filmmaker Paul Leni, it has somewhat mistakenly been lumped in with horror anthologies despite only subtly falling within the confines of the genre. In truth, it’s a hybrid of fantasy, historical drama, and horror, making it an anthology of styles rather than variations on one genre. The anthology is framed by young poet’s (William Dieterle) arrival at a wax museum, where he is tasked with writing stories backstories for the figures housed therein. His subjects are historical figures and include an Arab caliph (Emil Jannings), whom he imagines having a humorous feud with a baker over the latter’s wife. We then move into darker territory with a story about Ivan the Terrible (Conrad Veidt), a tyrannical Russian Czar with a penchant for torturing dissenters in his dungeon. 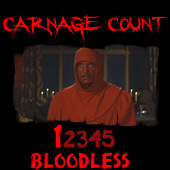 Finally, the poet himself finds himself at the mercy of the nefarious Jack the Ripper (Werner Krauss) when his wax figure seemingly comes to life to stalk him and his beloved. Once you know what you’re in for, Waxworks is kind of interesting, if not somewhat unbalanced as an anthology. Each story is obviously different from a tonal perspective, but they’re also of varying lengths, with the first story about the caliph taking up nearly half of the running time. As such, it feels like the film just sort of runs out of steam, especially once we arrive at the last section, which runs for a scant five minutes or so. Technically, only 2 stories (the ones about the caliph and czar) comprise the bulk of the narrative, while the Jack the Ripper segment (which will be of most interest to the horror crowd) feels more like a coda. Integrating the subject from the frame and making him the final subject of the anthology is certainly intriguing; to my knowledge, I’ve only seen that done in the Amicus film, Asylum, which wasn’t released until half a century later. In this respect, Waxworks is a bit ahead of the curve, and the frame in general exhibits a lot of ingenuity (and would be somewhat recycled 70 years later in another similarly-titled anthology, Waxwork). The stories are a bit of a mixed bag; my least favorite is actually the first one, which is doubly unfortunate since it’s the longest. While it has an interesting hook (the poet notices that the wax figure is missing an arm, so he attempts to write a story to explain that), but the story doesn’t require the runtime allotted to it. Still, Jannings is a boorish delight as the lascivious caliph (“no, I don’t mind that you don’t have clothes on,” he innocently tells the baker’s wife), and the climactic sequence involving his wish-granting magical ring slightly bends into fantasy territory. A downright jovial tale especially in its resolution, it’s dashing, Romantic, and even a little adventurous, featuring an impressively helmed chase scene involving some spectacular stunt work for the time. This is in stark contrast to the following tale, which is a cold, wintry parable driven by the paranoid Czar, relayed with wild-eyed insanity by Veidt. It almost feels like a subtle precursor to those slightly horror-tinged historical dramas Universal would pump out about 15 years later, as Ivan’s torments are put on display (well, as much of a display as was allowable, anyway). The climactic twist here is a classic turning of the tables that finds the Czar driven mad by his own devices, and the final image is somewhat haunting due to Veidt’s deranged facial expression. Most interesting is that final, all-too-short segment involving Jack the Ripper. As you might expect, this is when Waxworks is at its most atmospheric, suspenseful, and soaked in German expressionism as the famous slasher stalks his prey through an ethereal landscape. The aesthetic here tips the hand of the film’s final twist, but anyone who could see the fingerprints of Caligari all over this should see that coming anyway. Perhaps I enjoyed it most because it finally delivered those surreal silent horror thrills I had been waiting for, but this little sketch a beautiful bit of terse slash and stalk. Krauss’s ripper is eerily phantasmal and seemingly glides through the labyrinthine sets; had Waxworks been committed to this the entire time, it’d no doubt be among the finest horror anthologies I’ve ever seen. As it stands, though, it can’t earn that distinction due to sheer technicality--it isn’t a horror anthology, even if the last two segments tread the boundaries. Instead, it is a staggering collection of early German cinema; Leni of course is one of Germany’s great early masters, and Waxworks was his last film completed in his homeland. He’d soon depart for America, where he would go on to craft further classics like The Cat and the Canary and The Man Who Laughs, which also features Veidt in his most famous role. Veidt had previously starred in The Cabinet of Caligari and The Hands of Orlac, while Jannings had appeared in Faust along with Dieterle, who would also go on to have a prolific Hollywood career as both an actor and director (he even earned a Best Picture Oscar for The Life of Emile Zola in ‘37). Even John Gottowt should look familiar in the role as the museum owner, as he also portrayed the Van Helsing-esque professor in Nosferatu. What Waxworks may lack in thematic cohesion and tight pacing, it certainly makes up for with this stellar gathering of stars of the silent era. Don’t let the lack of horror chops deter you from this; after all, it is close enough, plus it has an early treatment of the Jack the Ripper story that’s been mined dozens of times for the genre. Plus, the technical display is quite astonishing; this was a huge production for the age, and it shows in the elaborate set design, especially in that first segment. Taking us from Arab streets to lavish palaces to dingy, humble abodes, Leni masterfully transports us through a fancifully realized land that recalls the whimsy of the Arabian Nights tales. Toss in some dazzling color tinting and you’re basically treated to an Expressionist feast. If anything, Waxworks serves as a fine introduction to the age, and Kino has rightfully restored it with a wonderful presentation. Their release includes the full 83 minute version (I can only imagine what’s missing from the 65 minute affair), and features a nice transfer that’s free of artifacts. Supplements include one of Leni's short films and an excerpt from Douglas Fairbanks's The Thief of Bagdad. Fans of early silent cinema will want to check it out, as Kino are the go-to folks for this sort of thing. Horror fans might feel a bit left out in the cold during this one, but when it is concerned with horror, Waxworks is pretty effective stuff. Buy it!